I seldom totally endorse any product, however, this magical machine has won my heart! I have searched through similar products for years and only become disappointed when they did not live up to my expectations. Nothing has fulfilled my needs for food preparation as has this machine. Nutrition can be delivered in its' most pure form for complete digestion of a variety of foods. This Blendtec product will allow you to add great nutrition from foods you may normally find difficult to add to your diet. Total Blender is the all-in-one appliance for the home gourmet chef to the everyday smoothie fan to make smoothies, fresh juice, ice cream, milkshakes, cappuccinos, margaritas, soups, sauces, bread dough, dressings, salsas and more! Just look at the recipes now available and I am told there is a newer book in the works for a more health conscious population! 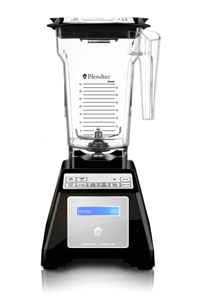 Blend Cycles Total Blender comes with exclusive Smart-Touch Tec-nology which means when a cycle button is pushed, the Total Blender automatically speeds up and slows down, then shuts off when the cycle is complete, so recipes turn out perfect every time. Order now to begin enjoying the benefits of the Total Blender! Click here to learn more or to purchase a Blendtec Blender!